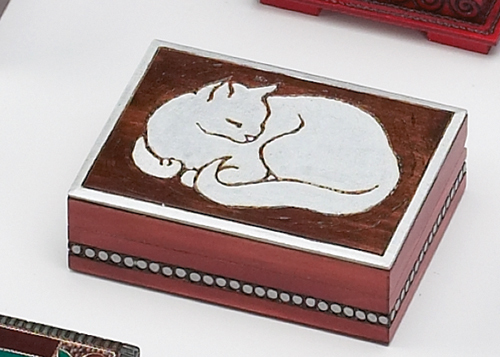 This urn is called Peaceful Cat as it depicts a peaceful cat laying on the top of the urn surrounded by a painted border along the lid and around the sides of the box. While the cat and trimmings appear to be white in color, they are silver. There is also a slightly larger size available. Dimensions: 5 in. x 3-3/8 in. x 1-5/8 in. This is very beautiful.I would recommend this if you have a kitten or a small cat. It arrived 1 week after I ordered.